The shops may be pumping out cheesy seasonal hits from the 70s, but at SipSwoosh Towers, we’re still firmly in an Autumn frame of mind. Mists and mellow fruitfulness. That kind of thing. And, as winter doesn’t officially start until 21st December, it IS still Autumn, dammit! So let me talk about truffles – the quintessential smell and flavour of Autumn – and Pinot Noir, the wine I reach for most at this time of year. Especially those that have developed earthy, fungal tones. My idea of heaven. I’ll admit then that Chilean Pinot Noir would not be my first port of call. There’s something of the Kardashian in many I have tried. But an invite to try some of Concha Y Toro’s fine wines with black truffles from Périgord at Bar Boulud London was too good to resist. And I was genuinely surprised about some of the wines. Take, for example, the Maycas del Limarí Pinot Noir Reserva Especial, 2010 . With a freshness and elegance I hadn’t expected, and wafts of earthy, fungal loveliness among the soft red cherry fruit, it punches well above its c. £12 weight. 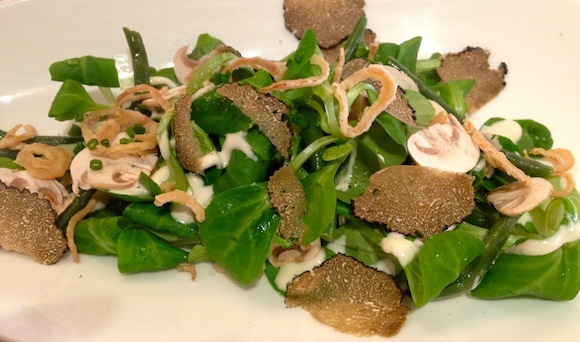 It made a good combination with truffled boudin blanc with extra truffle shaved on top. Or the perky, juicy Cono Sur Maiden Flight Pinot Noir Reserva 2010, which felt intensely fruity on its own but its brightness worked really well with the gentle crunch in a mushroom, truffle and lambs lettuce salad. Or the slinky, seductive, complex Cono Sur Ocio Pinot Noir 2008 , from a cooler year, and a wine that I personally preferred to the seemingly more concentrated 2009 (which would benefit from a couple more years cellaring to calm down). I was less fussed about Cono Sur 20 Barrels Pinot Noir 2007. Partly because I’d already had my head turned by two of the wines previously. And partly because I chose to take a sip of it with possibly the best piece of cheese I have eaten this year. Or for many years in fact. 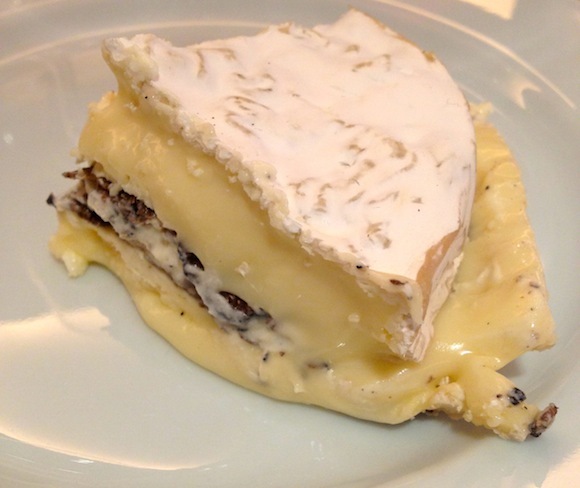 Gooey, ripe Tunworth cheese, slit through the middle by Bar Boulud and stuffed with shaved truffles. The tang in the cheese left the wine for dead. But it made me very, very happy indeed. It was fun to see which Pinot Noir worked (or didn’t) with truffled food. 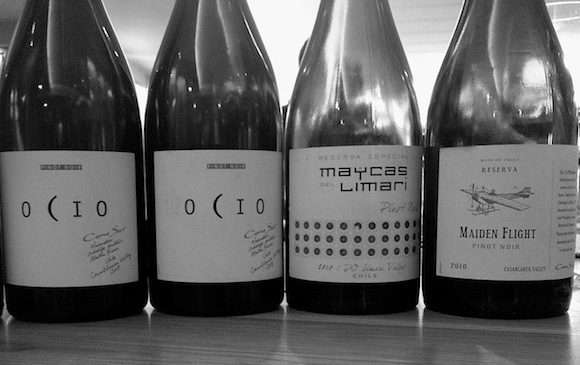 For me, though, it was a bit of an eye-opener to see how good some Chilean Pinot Noirs can be. I am not alone. According to wine trade magazine Harpers, which has just run a Chile Summit, figures from Nielsen show a 49% increase in sales of Chilean wine over £9. I’ve just contributed, by buying a bottle of that Maycas Pinot Noir.